"March Forward, Dear Mother Ethiopia"
1 Ostensibly Ethiopia is a democracy, but has a dominant-party system led by the Ethiopian People's Revolutionary Democratic Front. Ethiopia ( Ge'ez: ኢትዮጵያ ʾĪtyōṗṗyā), officially the Federal Democratic Republic of Ethiopia, is a country situated in the Horn of Africa. It is the second-most populous nation in Africa, bordered by Eritrea to the north, Djibouti to the northeast, Somalia to the southeast, Kenya to the south, and Sudan to the west. Ethiopia is the oldest independent country in Africa and one of the oldest in the world. Recently being regarded as "the cradle of civilization", Ethiopia is also the second-oldest official Christian nation in the world after Armenia. It has long been an intersection between the civilizations of North Africa, the Middle East and the rest of Africa. Unique among African countries, Ethiopia was never colonised, maintaining its independence throughout the Scramble for Africa. In addition, Ethiopia has long been a member of international organisations: it became a member of the League of Nations, signed the Declaration by United Nations in 1942, founded the UN headquarters in Africa, was one of the fifty-one original members of the United Nations, and is the headquarters for and the main founder of the former Organisation of African Unity and current African Union. Ethiopia was also historically called Abyssinia, derived from the Arabic form of the Ethiosemitic name "ḤBŚT," modern Habesha. In some countries, Ethiopia is still called by names cognate with "Abyssinia," e.g. Turkish Habesistan and Arabic Al Habesh, meaning land of the Habesha people. The English name "Ethiopia" is thought to be derived from the Greek word Αἰθιοπία Aithiopia, from Αἰθίοψ Aithiops ‘an Ethiopian’, derived from Greek terms meaning "of burnt ( αιθ-) visage (ὄψ)". 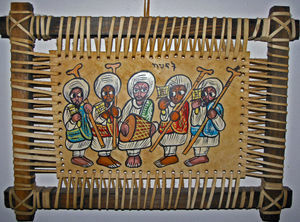 However, this etymology is disputed, since the Book of Aksum, a Ge'ez chronicle first composed in the 15th century, states that the name is derived from "' Ityopp'is", a son (unmentioned in the Bible) of Cush, son of Ham who according to legend founded the city of Axum. Human settlement in Ethiopia is very ancient: bones of the earliest ancestors to the human species, discovered in Ethiopia, have been assigned dates as long ago as 5.8 million years. Together with Eritrea and the southeastern part of the Red Sea coast of Sudan, it is considered the most likely location of the land known to the ancient Egyptians as Punt (or "Ta Netjeru," meaning land of the Gods), whose first mention dates to the twenty-fifth century BC. Around the eighth century BC, a kingdom known as Dʿmt was established in northern Ethiopia and Eritrea, with its capital at Yeha in northern Ethiopia. Most modern historians consider this civilization to be indigenous, although Sabaean-influenced due to the latter's hegemony of the Red Sea, while others view D`mt as the result of a mixture of "culturally superior" Sabaeans and indigenous peoples; a very small minority even views the kingdom as wholly Sabaean and Ethiopians as the descendents of an admixture of ancient Sabaean immigrants and Indigenous Africans. However, there is archaeological evidence to prove that at one point in time a region in Northern Ethiopia and Eritrea was called Saba. However, most modern scholars often refer to it as Ethiopian Saba since it had a separate entity than the Saba in Yemen. After the fall of D`mt in the fifth century BC, the plateau came to be dominated by smaller successor kingdoms, until the rise of one of these kingdoms during the first century BC, the Aksumite Kingdom, ancestor of medieval and modern Ethiopia, which was able to reunite the area. They established bases on the northern highlands of the Ethiopian Plateau and from there expanded southward. The Persian religious figure Mani listed Axum with Rome, Persia, and China as one of the four great powers of his time. It was in the early fourth century AD that a Syro-Greek castaway, Frumentius, was taken to the court and eventually converted King Ezana to Christianity, thereby making it the official state religion. For this accomplishment, he received the title "Abba Selama" ("Father of peace"). At various times, including a fifty-year period in the sixth century, Axum controlled most of modern-day Yemen and some of southern Saudi Arabia just across the Red Sea, as well as controlling southern Egypt, northern Sudan, northern Ethiopia, Eritrea, Djibouti, and northern Somalia. The line of rulers descended from the Axumite kings was broken several times: first by the Jewish (unknown/or pagan) Queen Gudit around 950 (or possibly around 850, as in Ethiopian histories). It was then interrupted by the Zagwe dynasty; it was during this dynasty that the famous rock-hewn churches of Lalibela were carved under King Lalibela, allowed by a long period of peace and stability. Around 1270, the Solomonic dynasty came to control Ethiopia, claiming descent from the kings of Axum. They called themselves Neguse Negest ("King of Kings," or Emperor), basing their claims on their direct descent from Solomon and the queen of Sheba. During the reign of Emperor Yeshaq, Ethiopia made its first successful diplomatic contact with a European country since Aksumite times, sending two emissaries to Alfons V of Aragon, who sent return emissaries that failed to complete the trip to Ethiopia. The first continuous relations with a European country began in 1508 with Portugal under Emperor Lebna Dengel, who had just inherited the throne from his father. This proved to be an important development, for when the Empire was subjected to the attacks of the Adal General and Imam, Ahmad ibn Ibrihim al-Ghazi (called "Grañ", or "the Left-handed"), Portugal responded to Lebna Dengel's plea for help with an army of four hundred men, who helped his son Gelawdewos defeat Ahmad and re-establish his rule. However, when Emperor Susenyos converted to Roman Catholicism in 1624, years of revolt and civil unrest followed resulting in thousands of deaths. The Jesuit missionaries had offended the Orthodox faith of the local Ethiopians, and on June 25, 1632 Susenyos' son, Emperor Fasilides, declared the state religion to again be Ethiopian Orthodox Christianity, and expelled the Jesuit missionaries and other Europeans. Yohannes IV of EthiopiaEmperor of Ethiopia and King of Zion, with his son and heir, Ras Araya Selassie Yohannis. The early twentieth century was marked by the reign of Emperor Haile Selassie I, who undertook the rapid modernization of Ethiopia — interrupted only by the brief Italian occupation ( 1936– 1941). British and patriot Ethiopian troops liberated the Ethiopian homeland in 1941, which was followed by sovereignty on January 31, 1941 and British recognition of full sovereignty (i.e. without any special British privileges) with the signing of the Anglo-Ethiopian Agreement in December 1944. However, Haile Selassie's government suffered various economic issues that led to the 1972-74 drought in Wallo killing 200,000 Ethiopians. Although Haile-Selassie was seen as a national and African hero, opinion turned against him as nobility filled their pockets while millions of landless peasants went hungry. In 1974 students, workers, peasants and the army rose against him. Haile Selassie's reign came to an end in 1974, mostly due to the economic hardship when a pro- Soviet Marxist-Leninist military junta, the " Derg", deposed him and established a one-party communist state. The ensuing regime suffered several coups, uprisings, wide-scale drought, and a massive refugee problem. In 1977 Somalia attacked Ethiopia, which sparked the Ogaden War, but Ethiopia quickly defeated them with a massive influx of Soviet military hardware and a Cuban military presence coupled with East Germany and South Yemen the following year. However from 1975- 1978, Mengistu Haile Mariam's Red Terror and massive relocation project led to the democide of 1,500,000 Ethiopians. In spite of accruing one of the largest armies in Africa due to benevolent military assistance from Socialist Bloc countries, an unending insurgency in the then provinces of Eritrea and Tigray, a major drought in 1985 and regime changes in the former Socialist Bloc culminated in the Derg regime being defeated in 1991 by the Eritrean People's Liberation Front (EPLF) in the far north, and elsewhere by the Ethiopian Peoples' Revolutionary Democratic Front (EPRDF), a loose coalition of rebel forces mainly dominated by the Tigrean People's Liberation Front. In 1993, following a referendum, the province of Eritrea became independent from Ethiopia, ending more than twenty years of armed conflict, one of the longest in Africa. In 1994, a constitution was adopted that led to Ethiopia's first multiparty elections in the following year. In May 1998, a dispute over the undemarcated border with Eritrea led to the Eritrean-Ethiopian War that lasted until June 2000. This has hurt the nation's economy, but strengthened the ruling coalition. On May 15, 2005, Ethiopia held another multiparty election, and resulted in the EPRDF's disputed return to power. In early June and again in November, police under the command of the EPRDF shot and killed 194 demonstrators and imprisoned thousands (including prominent opposition figures) who were protesting the alleged election fraud. However 8,000 prisoners have already been freed. And in October 2006, CUD supporters went to court as witnesses to accuse the opposition sub-party AEUP's leadership of attempting to stage a "coup" and encouraging its supporters to start an armed rebellion. The Government of the Federal Democratic Republic of Ethiopia was installed in August 1995. The first President was Negasso Gidada. The EPRDF-led government of Prime Minister Meles Zenawi has promoted a policy of ethnic federalism, devolving significant powers to regional, ethnically-based authorities. Ethiopia today has nine semi-autonomous administrative regions that have the power to raise and spend their own revenues. Under the present government, Ethiopians enjoy greater political participation and freer debate than ever before in their history, although some fundamental freedoms, including freedom of the press, are, in practice, somewhat circumscribed. 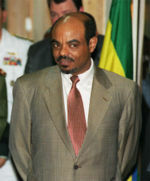 Zenawi's government was re-elected in 2000 in Ethiopia's first multi-party elections. The incumbent President is Girma Wolde-Giorgis with his term ending in 2006. Since 1991, Ethiopia has established warm relations with the United States and western Europe and has sought substantial economic aid from Western countries and the World Bank. In 2004, the government began a drive to move more than two million people away from the arid highlands of the east, proposing that these resettlements would reduce food shortages. Ethiopia held another general election in May 2005, which drew a record number of voters, with 90% of the electorate turning out to cast their vote. While the election was deemed by the European Union election observer team of Ana Gomes to fall short of international standards for fair and free elections, other teams drew totally different conclusions. The African Union report on September 14 commended "the Ethiopian people's display of genuine commitment to democratic ideals", and on September 15 the US Carter Centre concluded that "the majority of the constituency results based on the May 15 polling and tabulation are credible and reflect competitive conditions". However, it was noted that foreign election observers (including Ana Gomez, EU) were not given the authority and/or documentations in order to travel and monitor rural areas of the country. Even worse, these delays occurred a couple of days right before the election day and some have indicated the governments role in these delays, but couldn't provide substantial proof for their accusations. Still, the US Department of State said on September 16, "these elections stand out as a milestone in creating a new, more competitive multi-party political system in one of Africa's largest and most important countries." Even the EU preliminary statement of 2005 also said "...the polling processes were generally positive. The overall assessment of the process has been rated as good in 64% of the cases, and very good in 24%." The opposition complained that the ruling EPRDF engaged in widespread vote rigging and intimidation, alleging fraud in 299 constituencies. The ruling party also complained that the main opposition party CUD's AEUP sub party was engaged in intimidation. All allegations were investigated by the National Electoral Board of Ethiopia in cooperation with election monitors, a process which delayed the release of the final results. In June 2005, with the results of the election still unclear, a group of opposition supporters protested these alleged discrepancies despite a one month ban on protests imposed by the government. The government said that if there are no protests for one month, it would ease the high political tension in Ethiopia. Street protests broke out again later in the year when the CUD opposition called for a general strike and boycotted the new Parliament, refusing to accept the results of the election. The police forces once again attempted to contain the protests and this time forty-two people were killed in Addis Ababa, including seven policemen, and another of whom later died because of fatal injuries caused by a hand grenade detonation. Thousands were arrested, and were taken to various detention centers across the country. On 14 November, the Ethiopian Parliament passed a resolution to establish a neutral commission to investigate the incidents of June 8 and November 1 and 2. On September 5, 2005, the National Elections Board of Ethiopia released the final election results in which confirmed that the ruling Ethiopian People's Revolutionary Democratic Front retained its control of the government, but showed that opposition parties had increased their share of parliamentary seats, from 12 to 176. The Coalition for Unity and Democracy won all but one of the seats in Addis Ababa, both for the Parliament and the City Council. Now half of CUD, including Medhin have joined the parliament. In February 2006, UK Prime Minister Tony Blair, acknowledging that the EPRDF has won the election, said he wanted to see Ethiopia resolve its internal problems and continue on a democratic path. By February 2006, hundreds remained in custody, facing trial in March. Now there are about 119 that face trial, including journalists for defamation and opposition party leaders for treason. Human rights organisations have raised concerns over the well-being of some of these prisoners. However 8,000 prisoners have already been freed. There have also been concerns related to the implications for freedom of the press. On October 18, 2006 an independent report said Ethiopian police massacred 193 protesters, mostly in the capital Addis Ababa, in the violence of June and November following the May 2005 elections. The information was leaked before the official independent report was handed to the parliament. The leak made by Ethiopian judge Wolde-Michael Meshesha found that that the government had concealed the true extent of deaths at the hands of the police. This leak also brought more accusations that the opposition party which provoked the riots was trying to damage the reputation of the government by leaking the inquiry unlawfully. Gemechu Megerssa, a member of the independent Inquiry commission, which Mr.Meshesha once worked with, said Mr. Meshesha taking the report "out of context and presenting it to the public to sensationalise the situation for his political end is highly unethical." The judge in Europe described the deaths as a "massacre" and said the toll could well have been higher. However the judge was filing for a Asylum and is currently living in Europe, bringing a speculation that he was bias to begin with in support of the opposition party. But he claimed that he had to leave the country because he thought he would be "harassed" by the government. He speculated that Zenawi ordered troops to shoot at protesters. "We are not saying the government was totally clean. The government has a lot to be accountable for. The mentality of the police needs to be changed, and then we will be able to minimize those kinds of casualties in the future. Building of [democratic] institutions is required, but that is going to take time. [So] The government was not prepared to tackle violence like that which took place last year. They could have brought an alternative way of dispersing rioting crowds." But the independent Inquiry commission members added Mr.Meshesha going to Europe and reporting out of context information was "dishonest", ugly politics as well as insensitive to the process of developing Ethiopia's young democracy. Then the commission said Ethiopians need to solve their problems themselves so that these kinds of violences won't occur again. It said respecting authority & eachother and working together is important as well as changing the mentality of the police is what the "government has to think about seriously." Despite all these post-election issues & complications, in addition to the Carter Centre and the US government, British MPs continued to praise the democratic process in Ethiopia. After meeting with some opposition parties, the British MPs also stated that the Ethiopian government should always stand firmly against those who try to use "undemocratic and unconstitutional means" to change government. Presently, all except 20 of the elected opposition members have joined the Ethiopian parliament along with the EPRDF party members. The other top opposition parties,UEDF and UEPD-Medhin, are peacefully working with the government for negotiations on the democratic process. Yet many opposition parties are still represented in the Ethiopia Parliament where representatives from Oromia state hold the most positions and representatives from the Amhara State hold the second most position, in correlation with the population order of the corresponding states. Various opposition parties including UEDF, UEPD-Medhin, Somali People's Democratic Party (SPDP),EDL, Gambella People's Democratic Movement (GPDM), All Ethiopian Unity Organization (AEUO),Oromo Federalist Democratic Movement (OFDM)and Benishangul-Gumuz People's Democratic Unity Front (BGPDUF)hold positions in the parliament. Currently, some of the main opposition party's (CUD) leaders are in jail for an alleged attempt to overthrow the government and initiating the post election violence. All of these charges are denied by CUD leadership both in Ethiopia & international, and the European Union continues to plea for the political prisoners to be released after a speedy trial. Some of these elected CUD officials endure very harsh conditions inside Ethiopia's poorly maintained prisons and they are at risk of various medical complications. As a result of the violence after the elections, many thousands were arrested and imprisoned, even though some have been freed few still remain in prison. Upto the end of 2005, around 8,000 Ethiopian rioters were freed. The Crown Council of Ethiopia is the constitutional body which advises the reigning Emperors of Ethiopia, acts on behalf of the Crown and the council’s members are appointed by the Emperor. The Ethiopian monarchy has been abolished, but Ethiopian royalists continue to operate the Crown Council. On March 16, 2005, Prince Ermias Sahle Selassie was reconfirmed by Crown Prince Zera Yacob Amha Selassie as President of the Crown Council of Ethiopia. 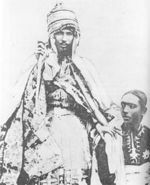 Zera Yacob Amha Selassie is considered Emperor in Exile of Ethiopia. At 435,071 mi² (1,127,127 km² ), Ethiopia is the world's 27th-largest country (after Colombia). It is comparable in size to Bolivia, and is a third smaller than the US state of Alaska. The major portion of Ethiopia lies on the Horn of Africa, which is the eastern-most part of the African landmass. Bordering Ethiopia is Sudan to the west, Djibouti and Eritrea to the north, Somalia to the east, and Kenya to the south. 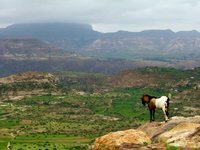 Within Ethiopia is a massive highland complex of mountains and dissected plateaus divided by the Great Rift Valley, which runs generally southwest to northeast and is surrounded by lowlands, steppes, or semi-desert. The great diversity of terrain determines wide variations in climate, soils, natural vegetation, and settlement patterns. Elevation and geographic location produce three climatic zones: the cool zone above 2,400 meters (7,900 ft) where temperatures range from near freezing to 16° C (32°–61° F); the temperate zone at elevations of 1,500 to 2,400 meters (4,900–7,900 ft) with temperatures from 16°C to 30°C (61°–86° F); and the hot zone below 1,500 meters (4,900 ft) with both tropical and arid conditions and daytime temperatures ranging from 27°C to 50°C (81°–122° F). The normal rainy season is from mid-June to mid-September (longer in the southern highlands) preceded by intermittent showers from February or March; the remainder of the year is generally dry. Before 1996, Ethiopia was divided into thirteen provinces, many derived from historical regions. Ethiopia now has a tiered government system consisting of a federal government overseeing ethnically-based regional states, zones, districts ( woredas), and neighborhoods ( kebele). 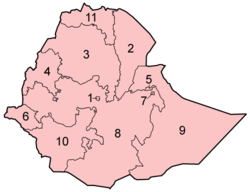 Ethiopia is divided into nine ethnically-based administrative regions (kililoch, sing. kilil) and subdivided into sixty-eight zones and two chartered cities (astedader akababiwoch, sing. astedader akababi): Addis Ababa and Dire Dawa (subdivisions 1 and 5 in the map, respectively). It is further subdivided into 550 woredas and six special woredas. Chartered cities shown in italics. * Southern Nations, Nationalities and People's Region. 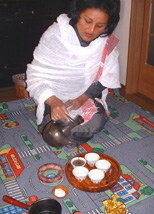 Woman coffee farmer filling cups with coffee in Ethiopia. Ethiopia has historically had one of the best economies in the world, which had continued on during reign of Haile Selassie, during which the value of the Ethiopian dollar was equivalent to the US Dollar. But soon, Emperor Haile Selassie couldn't reform economic policies and failed to improve the living condition of the people. In 1972 and 1973, more than 200,000 people died in the Wallo famine. The Emperor Haile Sellasie tried to hide the famine but university students revealed the drought to the world. After the 1974 revolution, the economy of Ethiopia was run as Command economy. Stronger state controls were implemented, and a large part of the economy was transferred to the public sector, including all agricultural land and urban rental property, and all financial institutions. The bad weather also continued to harm the agriculture sector. However since Mengistu Haile Mariam's relationship with the west was bad, the government hid the famine in Tigray and Wallo region causing the death of more than 250,000 Ethiopians. When the government finally allowed UN workers to witness the condition, one of the worst humanitarian crisis of the decade was revealed. Together with flawed relocation project and the Red Terror around 1,500,000 Ethiopians were killed under Mengistu Haile Mariam. Also six million people were in more famine before the EPRDF-led government overthrew the Derg regime. Then a lot of economic reforms were carried. Since mid- 1991, the economy has evolved toward a decentralized, market-oriented economy, emphasizing individual initiative, designed to reverse a decade of economic decline. In 1993, gradual privatization of business, industry, banking, agriculture, trade, and commerce was underway. Nevertheless, Ethiopia is still privatized. Many government owned properties during the previous regime have now been transferred to these EPRDF owned enterprises in the name of privatization. Furthermore, the Ethiopian constitution defines the right to own land as belonging only to "the state and the people," but citizens may only lease land (up to 99 years), unable to mortgage, sell, or own it. 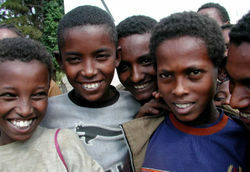 Schoolboys in western Oromia, Ethiopia. Semitic-speaking Ethiopians and Eritreans collectively refer to themselves as Habesha or Abesha, though others reject these names on the basis that they refer only to certain ethnicities. The Arabic form of this term (Al-Habesh) is the etymological basis of "Abyssinia," the former name of Ethiopia in English and other European languages. According to the most recent 1994 National Census, Christians make up 61% of the country's population, Muslims 33%, and adherents of traditional faiths 5%. Orthodox Christianity has a dominant presense in the central & northern Ethiopia, while both Orthodox & Protestant Christianity has large representations in the South and Western Ethiopia. Sometimes Christianity in Africa is thought of as a European import that arrived with colonialism, but this is not the case with Ethiopia. The Kingdom of Aksum was one of the first nations to officially adopt Christianity, when St. Frumentius of Tyre, called Fremnatos or Abba Selama ("Father of Peace") in Ethiopia, converted King Ezana during the fourth century CE. Many believe that the Gospel had entered Ethiopia even earlier, with the royal official described as being baptised by Philip the Evangelist in chapter nine of the Acts of the Apostles. Today, the Ethiopian Orthodox Tewahedo Church, part of Oriental Orthodoxy, is by far the largest denomination, though a number of Protestant ( Pentay) churches and the Ethiopian Orthodox Tehadeso Church have recently gained ground. Since the eighteenth century there has existed a relatively small Uniate Ethiopian Catholic Church in full communion with Rome, with adherents making up less than 1% of the total population. The name "Ethiopia" (Hebrew Kush) is mentioned in the Bible numerous times (thirty-seven times in the King James version), and is in many ways considered a holy place. Ethiopia is also mentioned many times in the Qu'ran and Hadith. While most Ethiopians accept that these are references to their own ancient civilisation, pointing out that the Gihon river, a name for the Nile, is said to flow through the land, most modern scholars believe that the use of the term referred to the Kingdom of Kush in particular or Africa outside of Egypt in general. Some have argued that biblical Kush was a large part of land that included Northern Ethiopia, Eritrea and most of present day Sudan. 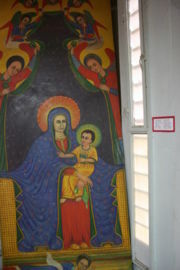 An Ethiopian depiction of Jesus and Mary with distinctively "Ethiopian" features. Islam in Ethiopia dates back to the founding of the religion; in 615, when a band of Muslims were counseled by the Prophet Muhammad to escape persecution in Mecca and travel to Ethiopia, which was ruled by, in the Prophet Muhammad's estimation, a pious Christian king. Moreover, Islamic tradition states that Bilal, one of the foremost companions of the Prophet Muhammad, was from Ethiopia. There are numerous indigenous African religions in Ethiopia, mainly located in the far southwest and western borderlands. In general, most of the (largely members of the non-Chalcedonian Ethiopian Orthodox Tewahedo Church) Christians generally live in the highlands, while Muslims and adherents of traditional African religions tend to inhabit more lowland regions in the east and south of the country. A small ancient group of Jews, the Beta Israel, live in northwestern Ethiopia, though most have emigrated to Israel in the last decades of the twentieth century as part of the rescue missions undertaken by the Israeli government, Operation Moses and Operation Solomon. Ethiopia is also the spiritual homeland of the Rastafari movement, whose adherents believe Ethiopia is Zion. The Rastafari view Emperor Haile Selassie I as Jesus, the human incarnation of God, a view apparently not shared by Haile Selassie I himself, who was staunchly Ethiopian Orthodox Christian. The concept of Zion is also prevalent among Ethiopian Orthodox Christians, though it represents a separate and complex concept, referring figuratively to St. Mary, but also to Ethiopia as a bastion of Christianity surrounded by Muslims and other religions, much like Mount Zion in the bible. It is also used to refer to Axum, the ancient capital and religious centre of Ethiopian Orthodox Christians, or to its primary church, called Church of Our Lady Mary of Zion. The best known Ethiopian cuisine consists of various vegetable or meat side dishes and entrees, usually a wat or thick stew, served atop injera, a large sourdough flatbread. One does not eat with utensils, but instead uses injera to scoop up the entrees and side dishes. Traditional Ethiopian cuisine employs no pork or shellfish of any kind, as both Muslims and Ethiopian Orthodox Christians are prohibited from eating either. 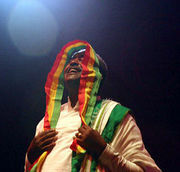 Mahmoud Ahmed, an Ethiopian singer of Gurage ancestry, in 2005. The Music of Ethiopia is extremely diverse, with each of the country's 80 ethnic groups being associated with unique sounds. Ethiopian music uses a unique modal system that is pentatonic, with characteristically long intervals between some notes. Influences include ancient Christian elements and Muslim and folk music from elsewhere in the Horn of Africa, especially Sudan and Somalia. Popular musicians included Aster Aweke Mahmoud Ahmed, Tilahun Gessesse, Asnaketch Worku, Gigi and Mulatu Astatke. Ethiopia has some of the finest athletes of the world, most notably middle-distance and long-distance runners. Kenya and Morocco are often its opponents in World Championships and Olympic middle and long-distance events. As of March 2006, two Ethiopians dominate the long-distance running scene, mainly: Haile Gebreselassie (World champion and Olympic champion) who has set over twenty new world records and currently holds the 20 km, half-marathon and 25 km world record, and young Kenenisa Bekele (World champion, World cross country champion, and Olympic champion), who holds the 5,000 m and 10,000 m world records. Other notable Ethiopian distance-runners include Derartu Tulu, Abebe Bikila and Miruts Yifter. Derartu Tulu was the first Ethiopian woman from Africa to win an Olympic gold medal, doing so over 10,000 metres at Barcelona. Abebe Bikila won the Olympic marathon in 1960 and 1964, setting world records both times. He is well-known to this day for winning the 1960 marathon in Rome while running barefoot. Miruts Yifter, the first in a tradition of Ethiopians known for their brilliant finishing speed, won gold at 5,000 and 10,000 metres at the Moscow Olympics. He is the last man to achieve this feat.